I don’t know about you but I cannot live without a good body scrub to keep my skin in good condition. Whatever the season, I exfoliate at least once a week. As well as helping to keep our skin smooth and silky by removing dead skin cells, it helps to improve the effectiveness of the moisturising products that we use. If you’ve ever noticed that your body moisturiser seems to just sit on the surface of your skin without delivering on its promise to hydrate, you probably need to exfoliate to remove the dead skin cells that are preventing absorption. If you are focused on positive ageing then this isn’t a step that you can skip. So to get and keep that all important glow start now – and here are some things to help you on your way to keep your skin in tip-top condition! So if you’re looking to keep your skin glowing… keep that coveted summer glow going, here’s what you should try! This is a fabulous UK based natural skincare brand. Their products are very affordable, with 97% natural ingredients and are paraben, sulphate and petrochemical free. Natural sugar crystals have been blended with moisturising Coconut and Monoi and some Shea butter, making this a fabulous scrub that won’t leave your skin dry afterwards. It also smells like a tropical paradise! Read our full review here. It’s not often that you put salt and sugar together but it works really well in this lush Malee Verdure conditioning body scrub. Of course, the salt and sugar don’t work in isolation, they are supported by a luxurious mix of nourishing oils including wheat germ, sweet almond and avocado blended with other potent nourishers like Shea butter. Oh yes, and the earthy fragrance is a mix of patchouli, mint and citrus is not only grounding but also strangely addictive… maybe that’s the brands African genes! This is where a treatment really does become an indulgent treat. Just opening the packaging alone is a thrill, I mean it’s not many body scrubs that come in a luxurious presentation box! This is not a scrub to rush, it’s one to allow yourself to take time with.. .a mindful moment. This salt glow comes in two parts – a bottle of oil and a jar of salts. Simple. Okay, let me expand on that. A bottle of beautifully scented essential oils that include Jasmine, lavender and geraniums as well as skin nourishing oils that include Vitamin E and Grapeseed. A jar of equally gorgeous smelling salts that are the colour of the sea and are infused with algae. All you have to after spending some time inhaling all of this lush gorgeousness is add the oil to the salts, mix and massage it into damp skin. Now I warn you, it’s easy to get carried away and just keep massaging because it feels amazing and smells amazing and you won’t want to rinse it off, but you must and when you do you’ll be left with your softest skin ever, plus you’ll be in a really relaxed and happy mood. This sugar-based body scrub is infused with organic sweet orange oil and smells absolutely yummy – you’ll almost want to eat it, it smells so good! This does exactly what it says it will do. It gently removes dead skin cells leaving soft and beautifully scented skin. As well as sweet orange oil, it includes organic sesame, apricot seed, sweet almond and vitamin e oils so your skin is getting a truly nourishing boost. Lush! This scrub is enriched with Rose and Lavender, which soothes and relaxes you. This smells yummy and really softens your skin. What makes this scrub special is that it uses Himalayan Salt, which is considered to be one one of the purest salts in the world, coming from the clean rivers and lakes of the Himalayan Mountains. The Rose and Lavender really enhances the whole experience, making this a true evening ritual. After this, I feel ready to sleep! 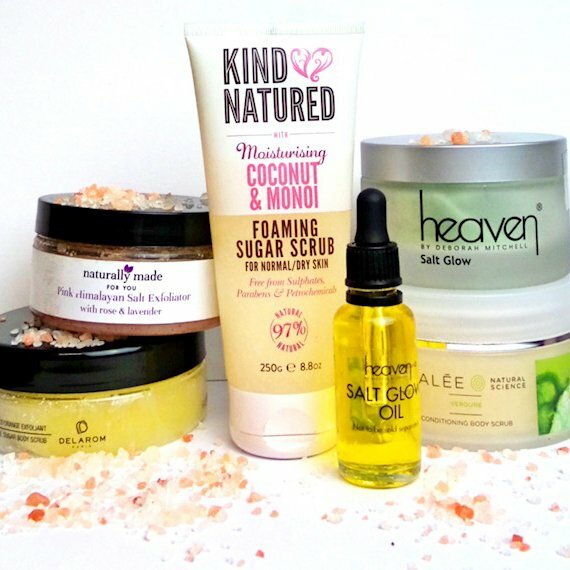 Dry skin treats from 'Kind Natured'! This sugar cane scrub by Beauty Works West works!